Perhaps summertime brings you memories of camping — whether it was with friends or family or a week at sleepaway camp. 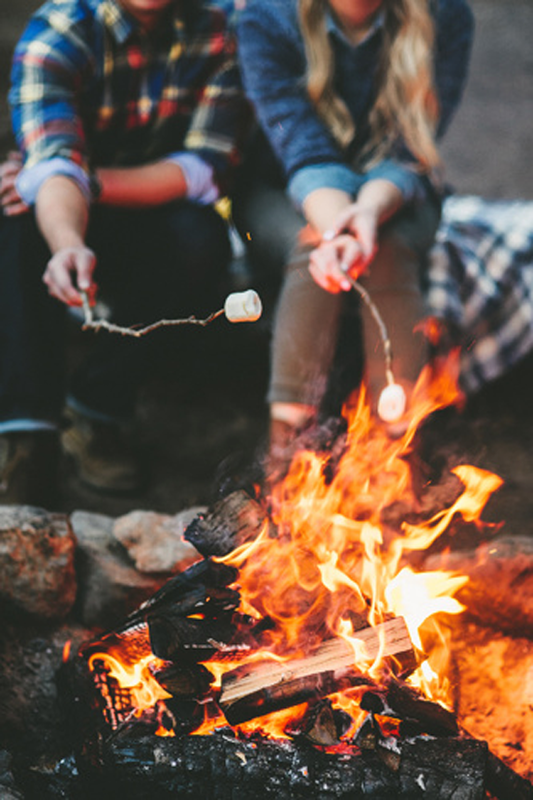 Celebrating summer with a camping trip is the perfect way to commune with nature, and these days, it gives you the chance to unplug and really experience your surroundings. 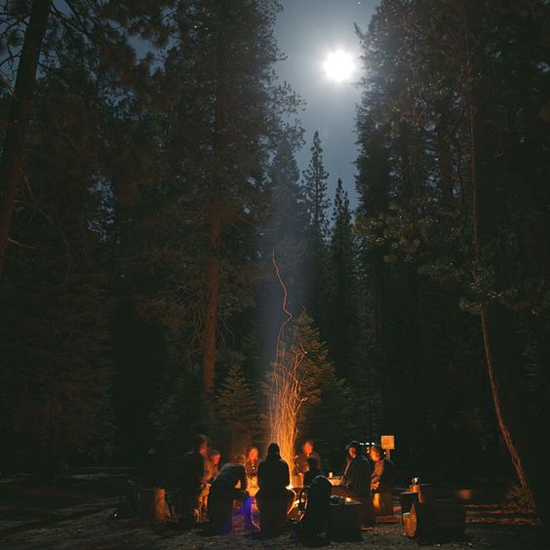 Add in fresh air, roaring fires, folksy tunes accompanied by guitar, long hikes, cool swims, and hanging out with your favorite people, and it's nothing short of magical. Oh my GOODness, that starry sky! What a glorious place to camp. It almost makes me want to pack up a tent and go. 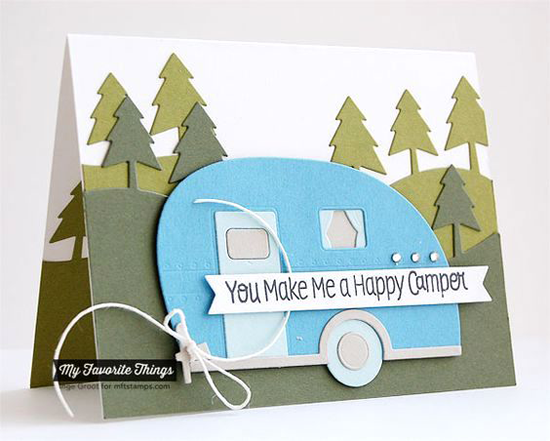 My Favorite Things has some fun products that allow you to put a little bit of the campground on your projects. Let's take a look at some awesome cards that will inspire you to create with the great outdoors in mind! 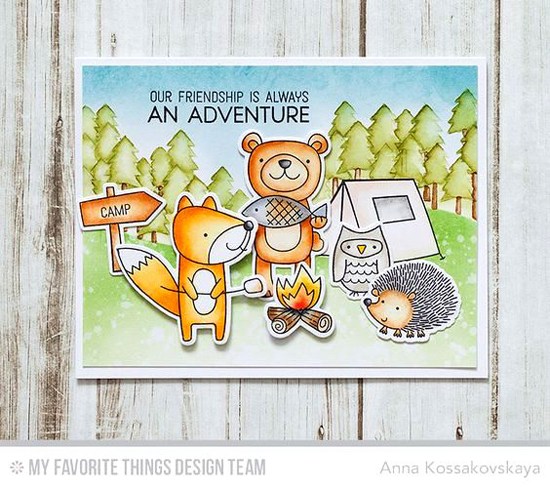 Anna's totally cute scene features the cute critters from the Warm & Fuzzy Friends Card Kit. 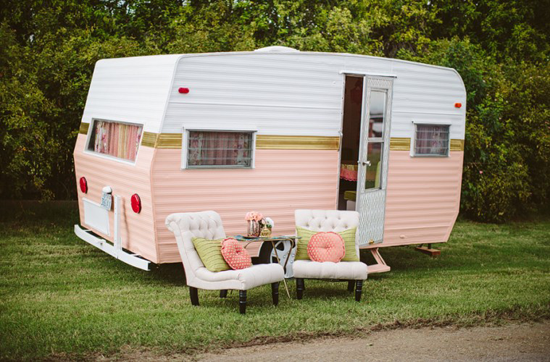 It's definitely an adorable way to send something special to a friend who loves camping. Francine creates a gorgeous and surreal sky behind some of the images from the Warm & Fuzzy Friends stamp set. I love how she used the Starry Sky Horizontal Stencil to create the pretty background! 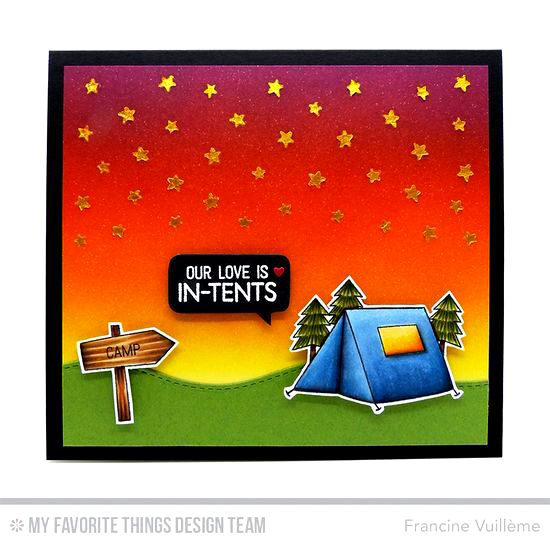 Inge makes an ADORABLE statement with the cute camper from the Happy Camper Die-namics set. 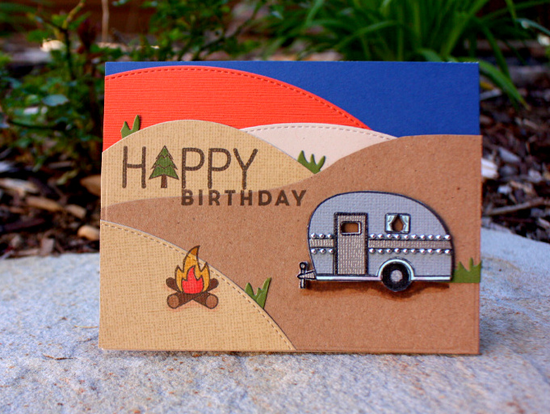 Set against the Tree Lines Die-namics, this is a fun card for a loved one or even a camptastic friend! 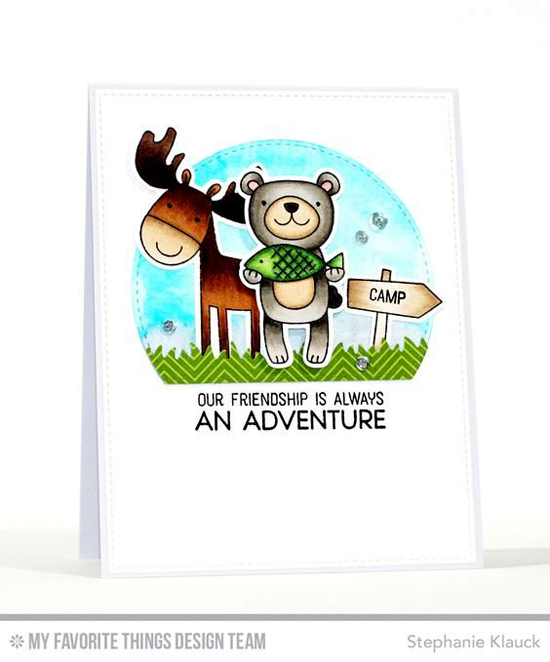 Moose and Bear are having a great camping trip on Stephanie's card. Looks like it's blue skies for these fantastic friends! 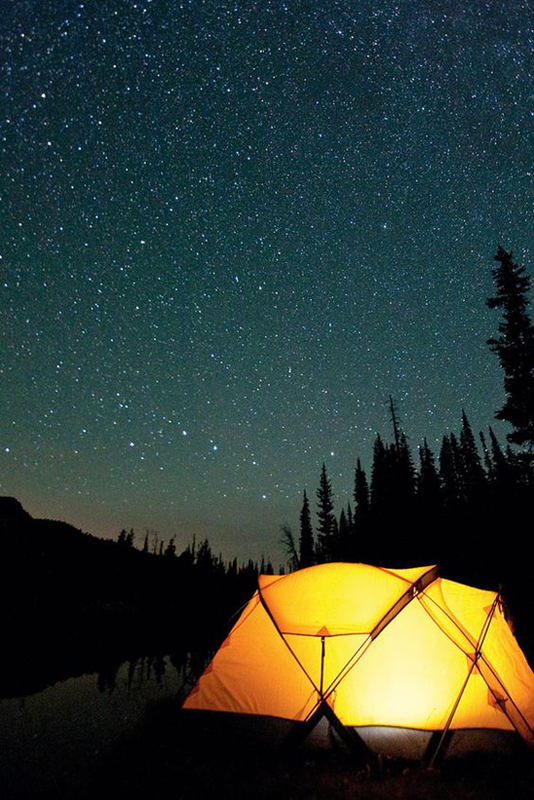 Got a friend who's an avid camper? Create a birthday card with the Roughing It stamp set! I made this card for a friend who loves to camp in Southern Utah where the red rocks dominate the landscape. Before you go, take a look at a few of the super fun camping related things you can buy at the My Favorite Things online store! Simply click on the photo to be taken directly to the product. If the product is currently out of stock, you can sign up for an email notification once it's back in stock! We've got a special week planned June 13-17! Join us for MFT's Camp Create HERE. 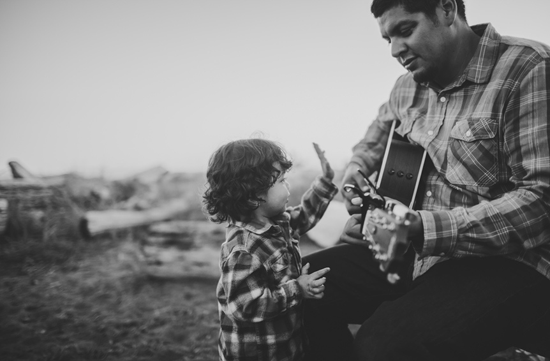 There'll be crafts, prizes, videos, and a whole lot of creative inspiration!